With so many airlines operating flights to Croatia it's fairly easy to get from Italy to Croatia. Still crossing Adriatic onboard ferry is an unique experience and can make your European journey more interesting. The most popular and well-services route that operates between Italy and Croatia are the one between the port of Ancona in the Marche region of Central Italy to the port of Split in Central Dalmatia. From Split you can easily continue your journey to other parts of Croatian coastline as well as inland area. Here are two boat lines to consider when making the overnight crossing between Ancona and Split. Note that this route is available throughout the year with fewer sailing during the winter time and frequent service in the season. 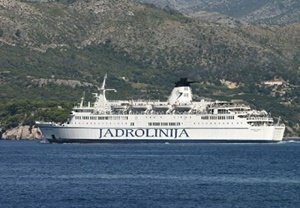 Jadrolinija is a Croatian state company that operates ferry route between Ancona and Split throughout the year. In the winter time there are 2 sailings a week, during the spring and autumn you can travel 3 times a week and in the high season 4 times a week. The trip departs in the evenings from both ports and arrive to the destination in the morning hours (the journey time is 11 hours). During the high tourist season (July and August) this ferry stops on the island of Hvar (Stari Grad) twice a week. "Marko Polo" ferry that sails on this route can hold up to 1100 passengers and 270 vehicles in its garage. Onboard the ship you will find a range of amenities such as children's play area, coffee bar, a restaurant with 222 seats, chapel and duty free shop. Regarding accommodation options onboard you can book deck fare meaning that you can use public areas for sleeping or reclining seat which gives more comfort. But for truly relaxing journey we advise you to book a cabin which range from 2 or 4 berth cabins (inside and outside). There are around 150 cabins onboard which can provide accommodation for 551 persons. Beside this ferry route, Jadrolinija operates two other ferry routes across the Adriatic - from Ancona to Zadar and from Bari to Dubrovnik. Italian company SNAV runs together another service from Ancona to Split. The service is seasonal and in 2019 it starts on 15th of April and terminates on 4th of October. This route is services "Aurelia" ferry. Crossing time between these two ports is 11 hours. Ferry stops on the island of Hvar (Stari Grad) twice a week during July and August. Facilities onboard the ferry include a self-service snack bar, restaurant, pub, shop and even a cinema to make the trip pass as quickly and comfortably as possible. 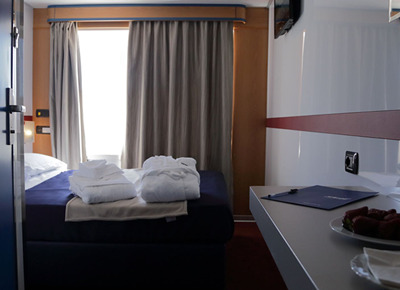 Cabins onboard range from 2 berth and 4 berth (inside and outside) as well as suites which are larger than traditional cabins and normally have separate sleeping and living quarters. An ensuite bathroom with a shower, sink and toilet is also part of suites and cabins while economy cabins don't have these facilities. If you don't want to book a cabin there are options of booking deck accommodation and reclining seat. We suggest you to book your tickets for Ancona to Split ferries well in advance, as berths and car spaces fill up fast for summer month sailings. 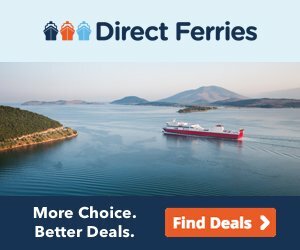 Booking ferry tickets with Direct Ferries is very easy as your tickets will be mailed directly to you.